Once again, Fairfield, Maine has proven to be the worldwide epicenter for firearms auctions. A.H. Fox "FE" Grade Shotgun with Special Gold Inlays, Sold For $166,750. Every fall, two separate firearms auction companies, James D. Julia, Inc. & Poulin Auctions, conduct firearms auctions back-to-back in Fairfield, Maine. Each time these auctions occur, the results generate the largest offering and largest sales gross for firearms auctions anywhere in the world. This year the Julia fall auction generated more than $15.1 million in sales, and combined with approximately $3.2 million produced at the Poulin auction pushed the entire gross to more than $18.3 million. For years Julia’s has sold at auction more rare and high end firearms for over $10,000 each than any other auction house in the world. This was proven again with no fewer than 9 World Records achieved and approximately 390 lots realizing $10,000 or more, 136 lots hitting $25,000 or more, nearly 40 lots coming in over $50,000 or more, and 9 lots topped out over $100,000. 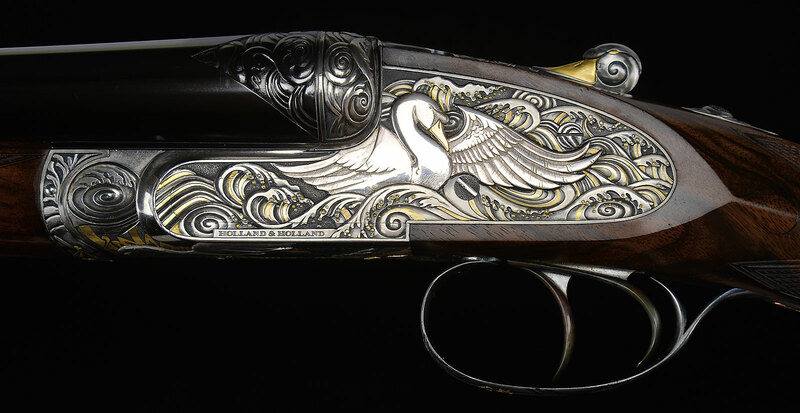 For nearly two decades now, Julia’s has been the world’s leading auction house for rare and valuable sporting arms. This auction featured over 500 lots of sporting arms which generated nearly $5 million, again confirming Julia’s leadership as the place to buy and to sell truly great sporting guns. Sporting guns showed great strength, regardless of gauge, as collectors seek out high quality arms. Stars of the sale included several of the A.H. Fox shotguns from the Dana J. Tauber Estate Collection, undoubtedly the finest collection of A.H. Fox shotguns to ever come to auction. The pièce de résistance from this collection was the exceptionally rare (1 of 3), extremely fine 20 bore Fox FE with special gold inlays. 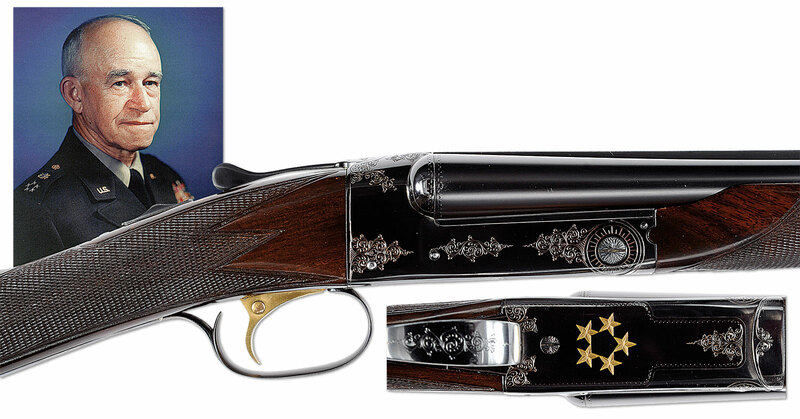 This highly coveted gun was estimated at $150,000-225,000 and realized $166,750, making it the top shotgun of the sale. Parkers and Winchesters did well and an outstanding Parker A-1 Special from the Bouwkamp Collection brought an astounding $142,600 against an estimate of $75,000-125,000, an exceptional price for an exceptional 12 gauge A-1 Special. Numerous fine Winchester Model 21s were included in the auction, the most important of which was a custom 20 gauge finished with 5 inlaid gold stars for the first chairman of the Joint Chief of Staff and one of just nine 5-star generals in the history of the US armed forces, Omar Bradley. Estimated at $100,000-200,000, it generated $115,000. Not to be outdone by their American counterparts, fine sporting guns from England and Europe also performed quite well in this auction. A stunning masterpiece by Holland & Holland known as the “Swan Gun”, a Royal Hammerless Ejector gun with extraordinary sculptured decorations with multi-gold inlays was estimated at $70,000-110,000 and sold for $120,750. A pair of truly superb original condition, lightweight, 16 gauge Golden Age Boss Sidelock Ejector guns came on the block with an estimate of $35,000-55,000 but flew far, far above the high estimate to an incredible $155,250. A stunning James Purdey and Sons Hammer Underlever 8 bore rifle was estimated at $60,000-80,000 and brought $69,000. Golden Age H&H Royal Hammerless Double Rifle .30 caliber Super was estimated at $35,000- 60,000 and realized $50,600. A superb Purdey Hammer Pigeon shotgun with exquisite relief engraving was of Royal descent, which at one time belonged to King Alphonso of Spain, sold for $57,500. 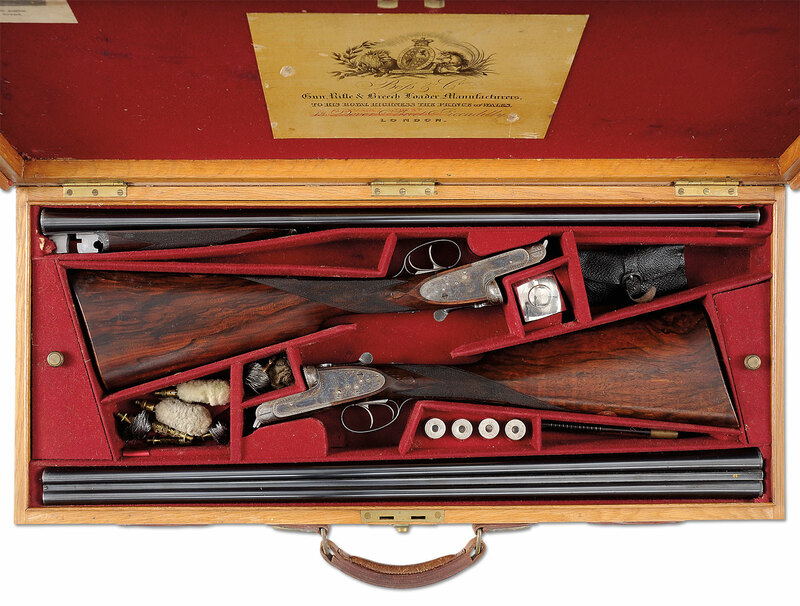 An unusual cased pair of high condition John Dickson Sidelock Ejector Game Shotguns in 12 gauge were estimated at $45,000-55,000 and when the bidding stopped, the final price realized was $51,750. Julia’s also regularly sells more high end, rare and valuable Confederate and Civil War arms than any other auction house extant today and this auction featured three well-known collections. The most competed for gun was an extremely rare Confederate Scoped Second Quality Whitworth Sharp Shooter’s rifle from the outstanding estate collection of Confederate and historical arms of Morris Racker. Estimated at $40,000- 60,000, it flew to almost 3 times the high estimate at $161,000 setting a new auction world record for this model. One of the true rarities and among the most coveted revolvers in Confederate collecting is the brass framed percussion revolver made in Portsmouth, Virginia by Thomas W. Cofer. This auction included Cofer revolver serial number 11, which is by far the finest example known. Estimated at $100,000-150,000, it sold for $103,500. Also from the Racker Collection was an extremely rare inscribed and cased early 1st model LeMat Grapeshot revolver that belonged to Confederate surgeon Thomas B. Memminger, son of Confederate Secretary of Treasure Christopher G. Memminger that sold for $57,500 against an estimate of $25,000-35,000. A very rare Colt Walker percussion revolver from the Robert Roughton Collection brought $71,875. The Fred Donaldson Estate featured a fine 1st model Griswold revolver that belonged to Confederate Captain John Morton that brought $23,000. A fine Civil War Cyrus Alger 1853-dated bronze 12 pounder Mountain Howitzer was estimated at $45,000-60,000 and sold above estimate at $69,000. After all was said and done, more than 170 rare Civil War arms and related items were sold in this auction, generating a total of nearly $2 million. This auction also featured the largest offering of Virginia Manufactory firearms to come to auction in many years, a total of 15 arms. The top performer was a rare 1809 dated 1st model pistol from the 3rd Virginia Regiment from the collection of Robert Roughton. It is very difficult to find examples of this gun in original flint, especially with the very desirable Virginia Regiment markings such as this one. After some intense bidding, this nearly all-original gun sold for $46,000, nearly four times the high end of its $8,000-12,000 estimate. Since 2008, James D. Julia, Inc. has sold more Class 3 firearms than all other North American auction houses combined, both in the number of units and in dollar value. This auction continued that tradition, generating extremely strong results with 102 lots sold bringing in excess of $2.3 million and six new auction world records. Leading the way for the Class 3 results was a Chinese Type 56 (AK-47) which came with a signed and notarized history from the U.S. Airforce pilot who acquired this gun during his combat tour in Viet Nam, and subsequently registered it during the Amnesty of 1968. A stellar specimen for its kind, it was estimated at $70,000-100,000 and when the hammer fell it had sold for $86,250. An exceedingly rare and highly desirable Cadillac Gage Stoner Model 63 LMG brought an auction world record price of $74,750 against an estimate of $50,000-80,000. Another world record came from an iconic and original German WWII MG-42 with tripod, which shattered its estimate of $35,000-40,000 and sold for $74,750. Another rare Class 3 record breaker was an exceedingly rare Model 1919 Colt Monitor Automatic Machine Rifle estimated at $50,000-75,000 and sold for $71,785. A historic Savage US Model 1917 Lewis machine gun that featured a US Navy anchor proof on the receiver and bolt soared past its estimate of $15,000-25,000 to bring an auction world record price of $57,500. 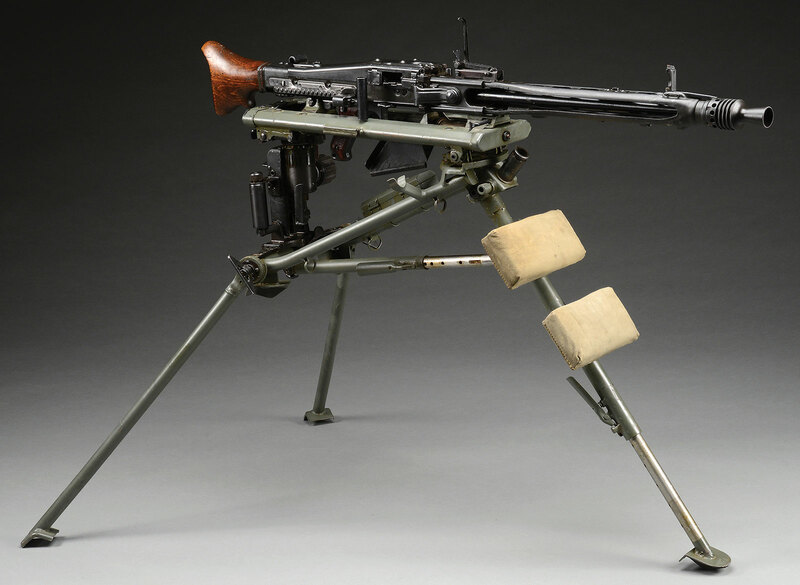 A Japanese Type 92 Heavy Machine Gun on Tripod with numerous accessories was highly competitive and sold for an auction world record $40,250 against an estimate of $18,000-28,000. Rounding out the Class 3 offerings were a number iconic Thompson sub machine guns, aka Tommy Guns, which were all highly sought after and brought strong prices. The best of these was an early Colt Model 1921 Thompson, serial number 935, originally purchased by the Santa Maria, California Police Department with just one private owner since. When Thompsons with serial numbers under 1000 surface for sale it is noteworthy. To find one in this kind of original condition with such provenance is truly extraordinary. Estimated at $45,000-60,000, this fantastic high condition example brought $51,750. In addition to being the undisputed leader for Class 3 firearms, Julia’s also specializes in other military arms and related items. This auction showcased a number of hard-to-find military weapons, including a Mauser C96 with exquisite factory engraving, special grips and matching burl stock. 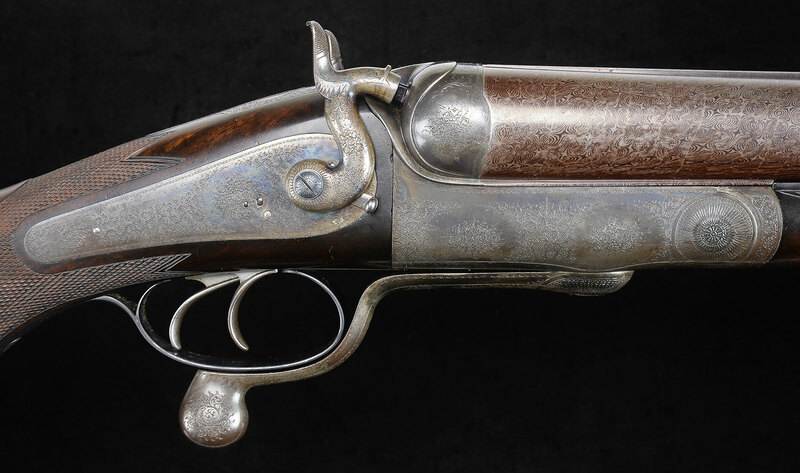 This gem of a gun was estimated at $35,000-65,000 and achieved a final price of $51,750. An extremely rare 20-shot Astra Model 900 semi-auto pistol with holster stock and original Astra box in excellent condition brought $37,375 against a $30,000-40,000 estimate. Gas Trap Garand rifles are a Holy Grail for many military collectors and are rarely offered at any price. This auction included an early production Springfield Armory M1 Gas Trap Garand rifle that was assembled in January 1938 with provenance attributable to well-known author and Springfield rifle collector, William S. Brophy. It carried an estimate of $17,500-22,500 and after some very competitive bidding was sold for $20,700. Several military vehicles were also sold in this auction, including a rare and desirable Soviet T-34/85 tank. 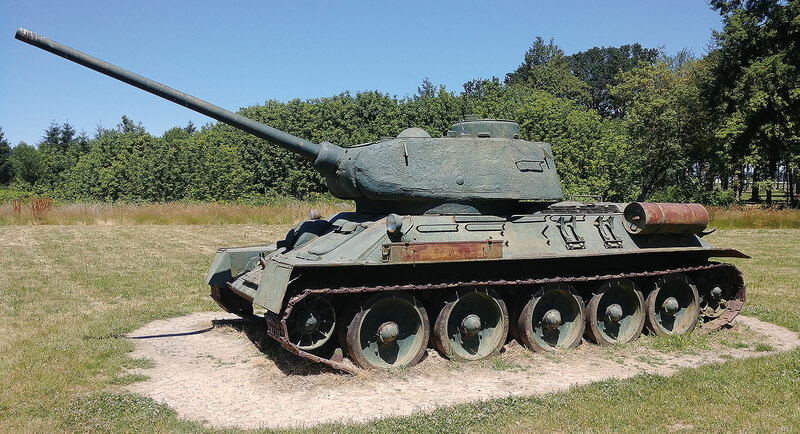 The T-34 was arguably the best tank of the Second World War, and this particular example sold for $46,000. As is usually the case for James D. Julia, this auction included numerous important and in some cases, iconic collections. The Warren Buxton Collection is a great example of an old iconic collection. Warren was a wonderful man, passionate collector, great scholar and amassed what is most certainly the finest, most comprehensive collection of Walther arms remaining in private hands today. He was also the author of what is considered to be the three Bibles on Walther pistols. This auction represented the second session for this collection, and among the notable items that are representative of discretion that Warren applied to his collection was an experimental Walther PP with a unique mechanism and semi-shrouded/solid hammer, distinctly different from production versions of this gun. It sold for $31,625 against an estimate of $20,000-30,000. Another fantastic example from the Buxton collection was a Walther Armee-Pistole in original condition with two matching magazines that is one of just 50 such firearms made for testing prior to the military’s acceptance of the P38. The late production, all matching specimen was estimated at $27,500-35,000 and sold for $28,750. There were a great many other exciting results for various other rare firearms and related items, drawing interest of collectors from around the world. The iconic and historic silver mounted Hawken Rifle of George W. Atchison of St. Louis, Missouri, 1836 is no doubt the finest and most elaborate of all Hawken rifles. Until now this gun had never left the family descents of E.R. Butterworth, who obtained the gun during his travels west in the 1870s, and was displayed in the Cody Firearms Museum for two decades. It sold for $109,250, exceeding its estimate of $80,000-100,000. The Winchester "1 of 1000" rifle is legendary, and a very rare and well documented Winchester Model 1873 “1 of 1,000” estimated at $75,000-125,000 brought a price of $103,500. A superb condition cased pair of double barreled flintlock carriage pistols with spring loaded bayonets by Isaac Blissett landed an auction world record price for any pair of bayonetted carriage pistols at $63,250 against an estimate of $27,500-35,000. An engraved and nickel plated Colt Medium Frame Lightning Rifle, which was Colt’s first attempt at a pump action rifle, that belonged to seven-term Mexican President Porfirio Diaz exceeded its estimate of $25,000-45,000 and sold for $51,750. Dozens of edged weapons were sold in this auction, including an extremely rare inscribed Scagel utility knife with ultra-rare ivory scales and original sheath from the Douglass H. Sandrock Collection. The blade on this extraordinary Scagel knife is marked on the right side in period script and sold for $23,000 against an estimate of $20,000-30,000. Also from the Sandrock Collection was a mint condition Scagel camp knife that was also estimated at $20,000-30,000 and sold for $20,700. A quite rare “War of 1812” US regulation naval boarding ax sailed through its $7,000-9,000 estimate and sold for $20,125. The majority of the high value items in this auction were sold in Julia’s first session known as the “Extraordinary Session.” The last two days of the auction featured what Julia’s refers to as the “Sporting & Collector Session” which consists of quality, moderately priced collectible firearms. There was particularly strong participation on both of those days with an unprecedented number of bids for a Julia firearms auction, and moderately valued guns did extremely well, achieving prices that were on average 28% over low estimate of the lots sold. Julia’s actively pursues rare and collectible firearms from all over the world and they are now preparing for their Spring 2018 auction. Their advertised special 0% commission rate to consignors selling high value guns is unique in the industry and is one of the many reasons Julia’s continually sells so many high end guns. As the #1 auction house in the world for rare and expensive firearms, James D. Julia doesn’t want to compete with their consignors by purchasing firearms but rather focuses on consigning them for auction and then working hard to achieve the best return on behalf of their consignors. ABOUT JAMES D. JULIA, INC.
James D. Julia, Inc. is one of the top 10 antique auction houses in North America as measured by annual sales. It is headquartered in Fairfield, Maine. The company also has an office just outside Boston, Massachusetts in Woburn and has been in business for nearly 50 years. The company conducts high end, antique collectables and fine art auctions throughout the year. Julia’s has routinely established new world auction records through its auction events. The company consists of three key divisions. The rare Firearms Division in which they are the leader today for high end, rare and valuable guns. Julia’s next Firearms Auction is scheduled for Spring of 2018 and will again include a fabulous collection of spectacular arms. Their next Fine Art, Asian & Antiques Division auction will take place in February 2018. Also, the Rare Lamp, Glass & Fine Jewelry Division, again a leader in this genre, will hold their next auction on December 1, 2017. Each division is regarded for its excellence and is staffed with world class specialists to ensure fair and professional authentication, identification and evaluation services. For more information on James D. Julia, Inc. please visit http://www.jamesdjulia.com. James D. Julia, located in Fairfield, ME and Woburn, MA. Winchester Model 1873 "1 of 1,000" Lever Action Rifle, Sold For $103,500. Colt Medium Frame Lightning Rifle the Belonged to Porfirio Diaz, Sold For $51,750. Extremely Rare Cofer Percussion Confederate Revolver, Serial Number 11, with Holster, Sold For $103,500. 1st Model Lemat Grapeshot Revolver Belonging to Confederate Surgeon T. Memmiger, Son of Confederate Secretary of Treasury C. Memminger, Sold For $57,500. Confederate Scopes 2nd Quality Whitworth Sharpshooter's Rifle, Sold For $161,000. 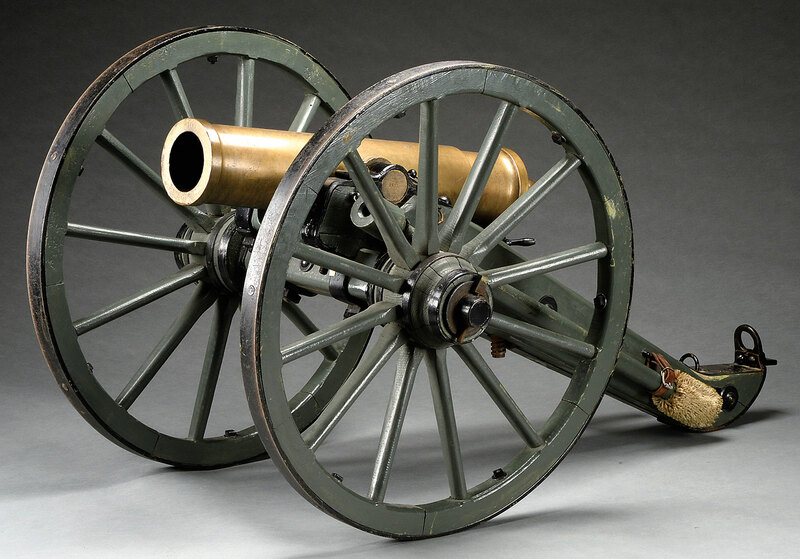 Civil War Cyrus Alger 1853-Dates Bronze 12 Pounder Mountain Howitzer, Sold For $69,000. Silver Mounted Hawken Rifle of George W. Atchison, Finest and Most Elaborate of All Hawken Rifles, Sold For $109,250. Rare 1809 Dates Virginia Manufactury 1st Model Pistol, Sold for Auction World Record Price of $46,000. Inscribed Scagel Utility Knife with Ultra-Rare Ivory Scales and Orignal Sheath, Sold For $23,000. Parker Brothers Grand Old Parker "A-1 Special" 12 Gauge Shotgun, Described and Illustrated in "The Parker Story," Sold For $142,600. 20 Gauge Winchester Model 21 Factory Custom Finished and Gold Inlaid Shotgun Presented to Five Star General and First Chairman of the Joint Chiefs of Staff Omar N. Bradley, Sold For $115,000. 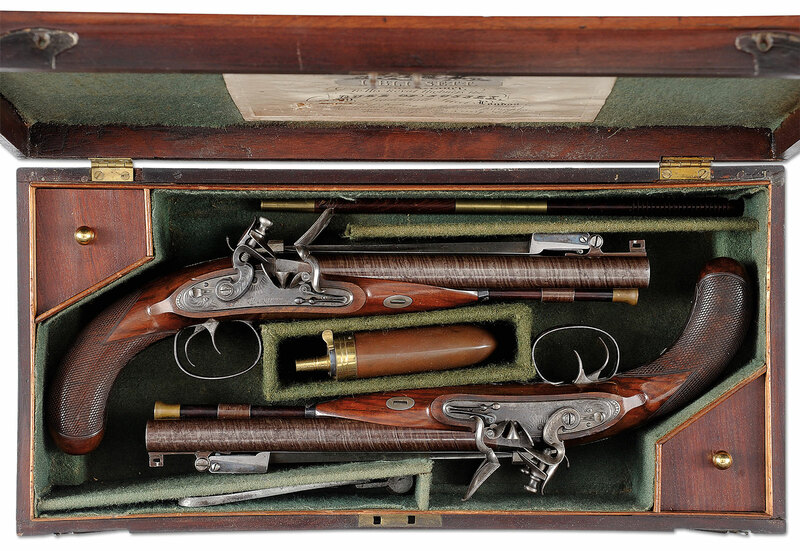 Pair of Flintlock Carriage Pistols with Spring Loaded Bayonets by Isaac Blissett, Sold For $63,250, The Auction World Record Price for Any Pair of Bayoneted Carriage Pistols. Possibly Unique James Purdey & Sons Hammer Underlever 8 Bore Rifle Sold For $69,000. Holland & Holland "Royal" Hammerless Ejector 12 Gauge Masterpiece Shotgun, with Multi-Colored Gold Inlaid High Relief by Rashid El Hadi, Sold For $120,750. "As Found" High Original Condition Pair of 16 Gauge "Golden Age" Boss Sidelock Ejector Double Trigger Light Game Shotguns, Sold For $155,250. Factory Engraved Postwar Mauser C96 with Special Grips and Matching Burl Wood Stock, Sold For $51,750. 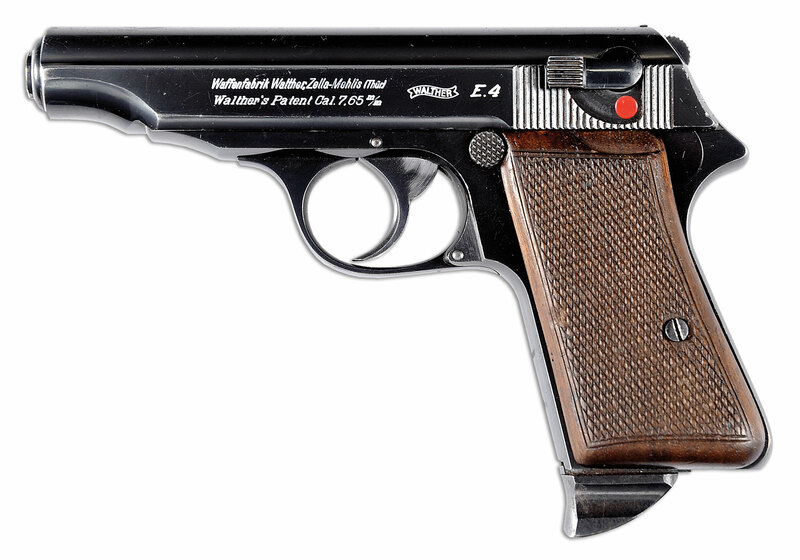 Experimental Walther PP with Unique Mechanism and Semi-Shrouded/Solid Hammer, Sold For $31,625. Soviet T-34/85 Tank, Sold For $46,000. Colt Monitor U.S.M.C. Marked Machine Gun, Sold for Auction World Record Price of $71,875. Cadillac Gage Stoner Model 63 Light Machine Gun, Sold for Auction World Record Price of $74,750. Original German WWII MG-42 Machine Gun with Tripod, Sold for Auction World Record Price of $74,750. Japanese Type 92 Heavy Machine Gun on Tripod with Extremely Rare Original Manual, Sold for Auction World Record Price of $40,250.